You like comics? You like action? You've always wanted to see a comic using professional looking animations? 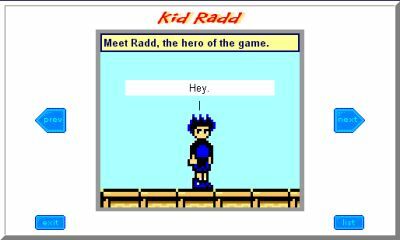 How about giving Kid Radd a try? I promise: You won't regret it. Dan Miller's comic features everything you need: Humor, love, action and an intense storyline full of surprises. Plus: He uses a very innovative technique which improves the loading speed of the comic. Wanna know more? Read on! Well, the economy could be better and there's a lot of volatile predicaments in the Middle East right now, not to mention North Korea. Oh, but everything with me is fine. Before I start asking the hell out of you it'd be nice if you could provide us with a personal introduction. I'm a 27-year old guy who does a comic strip. My "real" job is managing an ice cream shop, a job I gladly took after a few years of temping, in which I learned that I hated office work. (The sick thing is, I was good at it...) I went to college for public relations, but preferred staying in Cleveland to moving to New York or California, so I never really pursued that field. It's one of a million choices I've made that I didn't think out very well, but luckily I ended up happier for it. I'm the hardest working slacker you'll ever meet. First, why do you like comics? I got hooked by reading old Peanuts collections when I was a kid. I started making crude comic books, penciling out square-ish panels with a ruler. The thing is, I have a very visual imagination. Because of this, I've always had a larger fascination with animation, and the comic books I made back then were almost substitutes for what I couldn't animate. They were like storyboards for what I actually saw going on in my head. Needless to say, with KR I've been able to make the action come closer to my imagination than I could with a non-animated comic. Do you read any other webcomics actually? Pretty much everything listed on my links page, plus a few others that I've been too lazy to get around to adding. As far as humor goes, strips like Elftor and Spelling the Vacuum are funniest to me. But certain strips like No Need for Bushido and Angel Moxie have me pulled in by the story, and that's something I hope to emulate, too. Truthfully, from the beginning I've held the plot to be more important than the humor. Strips like RPG World showed me that people would be willing to accept a story that occasionally drops the humor for sake of storytelling, giving me more courage that I could do a story-oriented comic like KR. Why are you doing a (fake-) sprite comic? It's a weird case of function dictating the form. When I was designing the strip, I wanted a lot of animation but also wanted it to load quickly. I knew I could pull this off by making tiny animated gifs and blowing them up several times larger. Of course, that makes the pictures look jagged and boxy. Video game characters seemed like the obvious choice to excuse the pixelation. Were you worried that people wouldn't like the innovative style of your comics when your page went online? Your comic features animations beyond most standards. Is it still "just" a comic? Isn't it almost becoming a movie without sound? Yeah, it's some sort of weird slide-show/animation hybrid. The few comics that have midis synched into them as music videos stray even further across the line. I guess as long as there isn't any voice acting involved, it stays closer to being a comic strip than a cartoon. Your mind is still filling in the critical gaps for the characters' personalities, "acting" and voices, your imagination just gets to relax a little on the action sequences. Have you ever thought about doing a game or an animated movie using the characters of your comic? But recently I've given more consideration to making a short film with the KR gang, though I have no idea where I'd get decent music or voices for such a project. Still, I think I'd enjoy the process of making some "real" animations with drawn versions of the characters. I love minimalistic character designs a la Genndy Tartakovsky, so they probably wouldn't look terribly different from their sprite versions - heck, I'd be trying to make them as similar to their originals as possible, minus the pixelation. But I can't make any promises about anything now, since I won't have the time to work on side projects until KR is almost over. Is it difficult to do a strip for your comic? How long does one take? Both the difficulty and time vary quite a bit. On average, I'd say about an hour per strip, but that's highly dependent on how much of the art I've pre-made. Every time the story introduces new locations and characters, I spend a decent amount of time creating new artwork for that chapter. So of course, after that's done, the strips can be made more quickly. Oh, and needless to say, the action scene animations are usually the most time-consuming part of making KR. The Radd vs. Gnarl battle took days of work; I should've timed myself just for the heck of it. Have you ever experienced any technical problems with your website? How do you get your inspiration for all those storylines and punchlines? The storyline's sketelon was written almost three years ago, and like most inspiration, I really don't know where most of it came from. 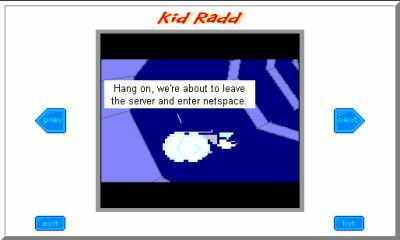 I do know that the first series of jokes that popped into my head were the ones involving Radd as an uncooperative Office Assistant. I was an office temp at the time, so it's not hard to guess where that idea came from. The story started to fall into place after I decided that it might be humorous to show video game characters from games with conflicting rules trying to interact with each other. I came up with the ending almost immediately, writing the beginning took longer. Ever since that point, I've been focusing on the story and making up most of the jokes as I go along. (Sadly, it often shows). I made some weird choices for the beginning of the strip that I sort of regret now; I thought that having Radd talk to the narrator (a subtle jab at typical sprite comics) during his original game would provide a nice setup during the time that Radd had nobody to talk to. When he gets into the "real" world and fourth wall violation suddenly disappears, it was supposed to be a clue of the seriousness of what happened, but... In retrospect, bad idea. Starting the comic like "just another sprite comic" is practically asking people to run away screaming. Does the comic affect your real life? I suppose the self-imposed deadlines have the biggest effect, though they rarely get in the way of the rest of my life. If anything, it's taught me more discipline. What would you do if you couldn't post a comic for one week because of illness or other circumstances? Is it a good idea to let fans wait? Maybe I'd let my brother Dave (a.k.a clowcards, forum mod) take the reins and do a "Dead Danno Week." Actually, near the beginning of the strip when I had maybe a dozen readers, my old computer died. Of course, it did so at a time when I was pretty strapped for cash and needed to fix my car before worrying about luxuries like computers, and the strip ceased to exist for a couple of months. All I could do was leave a message on the forum saying, "It'll be back... eventually." Fortunately, I have a much steadier income now than back in my temp days, so I don't forsee a disaster of that magnitude happening again. At worst, it'd be a short "involuntary hiatus" like Ian's having with RPG World right now. Does the webcomic industry have a future or will it forever be something people do as a hobby? At best, I see webcomics becoming like the independent film of the comic world. Lots of people will get into it, and a few lucky folks will actually make money off it, but for the most part it won't be real competition for the big syndicates. Ironically though, a cartoonist for the syndicates doesn't make much money either. Just look up what Bill Watterson has to say about it, and prepare to get depressed. Would you accept it if someone came along and told you that he would like to buy KidRadd, including all copyright stuff, so that you would be kinda rich, but never being able to add a comic strip again? Right now, probably not. A year from now, possibly, because that's about the time I expect this strip to end. I might start a subcomic that still uses the characters for comedic purposes, but when the story ends, I will have done everything I'd intended with KR, including hopefully getting some kind of message across. If someone wanted to buy and somehow continue the story after that point, I guess it'd be possible, but probably anticlimactic. The story will go out with a bang (well, several bangs) that might be hard for future stories to live up to. I just hope that my art can meet the challenge of depicting what's to come. How many people have already advertised on KidRadd.com? Do you sell a lot in your store? About a dozen separate people/strips/sites have advertised since I started the ads, nearly a year ago if I recall correctly. The store has only sold a few shirts. I suppose I really haven't been trying to push it though; I oughta switch to zazzle or some other non-cafepress supplier and make some better shirt and/or poster designs. I'm really not very business-minded, so maybe I should get one of my more successful relatives to figure out how to make my stuff profitable. Let them worry, and I'll keep doodling. Do fan arts play a certain role when doing webcomics? They don't affect the story or creation of the strip, but they're fun to get. It's always interesting to see hand-drawn versions of my characters, because the artist has to do a lot of interpretation. They have to decide, "Okay, what do I think Sheena really looks like?" 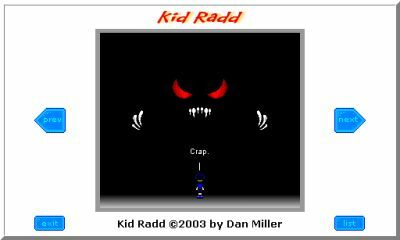 Do you plan anything huge for Kid Radd in the future? I think (hope) people will be surprised where the story goes as it nears the end. Which character of your comic do you like best? I like Bogey a lot because he's the most expressive, but in the end Radd has to be the fave. The comic is his story, and though the others get to share in the angst, he's the one who has to philosophize about it. What are your general career goals? They're pretty loose at the moment. The owners of the ice cream store I manage at would like me to consider buying the place from them when they retire, but that's at least a decade down the road so I've got plenty of time to decide. I suppose that I'd also like to make some steady income of off something web-based, but that'll depend on whatever projects I take up in the future. My only definite career is to never wear a tie again. My all-time fave will probably always be Chrono Trigger (SNES), just because it was the first game where I found myself caring about the characters with movie-like sympathy. In my opinion, few other games since then have done it as well. Then there's lots of runners-up like Final Fantasy Legend II (GB), Star Tropics (NES), just about any Mega Man game (currently Mega Man Zero 2 for GBA, damn it's tough), and others I know I'm forgetting about. Anything else you want to get rid of? Um, Supertramp rules? Nah, I'm done. Thank you for your time. Wish you good luck for your life and your comic.